I’ve been analyzing a shocking dream about a man running away from something unseen. While trying to climb a wall, he is severely cut by broken glass. Scroll down to my previous two posts to follow this discussion. I asked the dreamer to “Tell me about” his various dream symbols. Here are his responses. * Didn’t know from what: There’s an unknown threat, like a mystery. * Afraid: I feel as if my life is in danger. * Vital to escape: If I can get away, that would bring me back to calmness. * Wall; 7-8 feet: A barrier that was tall, but not impossible to get over it. * Effort to climb over: Climbing was work, but I knew I could succeed. * Hand and arm on top: Reaching this point was the first major milestone in scaling the wall. * Sharp pain: Excruciating discomfort. 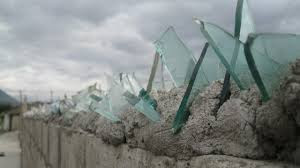 * Embedded with broken glass: It was designed to repel and cause injury. * Presumably still hanging: It was kind of surreal. Things were happening that really couldn’t. * Lift to look: I was examining where the pain came from. * Ripped open: Everything inside was exposed in an awful wound. It was hideous. * Tendons and bones: I was looking at the inner workings that make my arm function. * Usually gray scale: Most of the time these kinds of events seem to happen at a distance—where I’m removed from them. * Vivid red: There was a realism that was shocking. * Horrified: I was debilitated, almost paralyzed. Now let’s reassemble this dream replacing the original symbols with the dreamer’s own descriptions of them. We’ll also insert phrases to remind the dreamer that all the symbols are aspects of himself. I need to escape from an unknown threat inside of me. It’s like a mystery. I feel as if my life is in danger. Getting away from this part of me would bring me back to calmness. There’s a barrier in me, but it’s not impossible to get over. It takes work, but I can succeed. In fact, I reach the first major milestone. But I feel excruciating discomfort. This barrier in me is designed to repel and cause injury. It’s surreal. Things are happening that really can’t. I am examining where my pain comes from. Everything inside of me is exposed in an awful wound. It’s hideous. I am looking at my own inner workings. While most of these kinds of things happen at a distance for me, this time there is shocking realism. I am debilitated, almost paralyzed. It takes very little work to see the poignant and consistent metaphoric themes in this dream restatement. There is the sense of anguish, the attempt to escape from something inside of himself, temporary hope, the powerful, hurtful resistance that he experienced in his efforts, the sense of vivid crisis, the feeling of debilitation. Even during our discussions the dreamer was distressed and crying. We’ll help him resolve the issue tomorrow. Stay tuned!